There are few words in the world that make me smile, no matter what my mood. "There are flowers for you at the front desk," works, as does "knitting jumpers for chickens." Yes, jumpers for chickens, which is how the British say, "Throwing yarn into the barnyard in such a way as to embarrass local poultry." Other fabulous words include "tocks," "sale," "cheeeeeeese," and "As you wish." 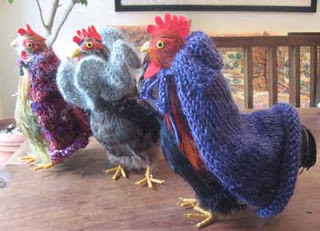 Chicken couture courtesy Mason-Dixon Knitting.